A portal framed barn situated in a favoured semi-rural location on the edge of Egerton village with Prior Approval for a change of use for an agricultural building use to a four bedroom single residential dwelling approximately 2274 sq ft (211 sq m) with brick stabling and agricultural land the whole extending to approximately 1.8 acres (0.72 hectares). Farriers Barn occupies a fine semi-rural location on the edge of this popular Wealden village providing basic amenities, post office stores, garage and the Barrow House pub/restaurant. Headcorn village is situated approximately 5 miles distance providing good everyday amenities including Sainsburys local. The county town of Maidstone and market town of Ashford are situated 14.3 miles and 5 miles respectively providing a comprehensive range of amenities. Headcorn and Pluckley stations are situated 5 miles and 3.1 miles respectively providing fast and frequent services to London. Excellent schools in both the state and public sectors are available, in particular grammar schools in Ashford and Maidstone. Farriers Barn is situated in a semi-rural location approached via a tarmacadam drive. Neighbouring The Farriers has a vehicular right of way over the initial section of the drive. The building comprises an agricultural concrete portal framed barn presenting elevations of block, rendering and fibrous cement corrugated cladding beneath a pitched fibrous cement corrugated roof (13.90m x 7.60m). The approved plans show the following accommodation; entrance hall, cloakroom, utility room, sitting room, dining room, kitchen/living room, first floor four bedrooms incorporating a master bedroom with an ensuite shower room and a separate family bathroom. Situated alongside the barn is a detached brick stable block 18.30m x 3.30m beneath a pitched tiled roof, comprising five loose boxes with single glazed windows. Concrete hard standing runs to three sides of the buildings. Situated towards the top of the driveway approach is a detached block and rendered garage (6.30m x 4.30m) with a mono pitched roof and a greenhouse (5.95 x 3.85m) of brick and timber construction with single glazed panels. To the front of the building is a post and rail paddock. To the rear of the buildings, a small stream runs with a second paddock enclosed by a mixture of hedging and stock proof fencing. The total plot size extends to approximately 1.8 acres (0.72 hectares). 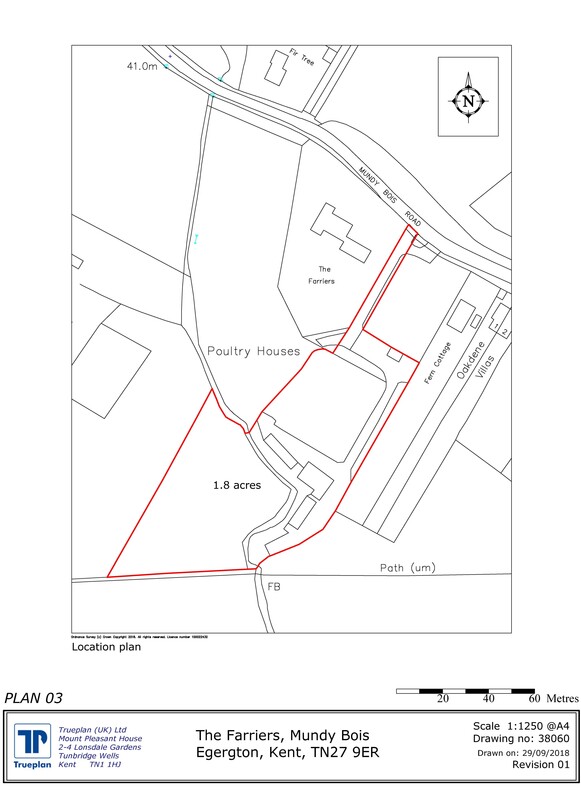 Prior approval for a change of use for an agricultural building including land with its curtilage into a single residential dwelling and associated operational development was approved by Ashford Borough Council reference 18/01696/AS (subject to conditions) on 5th February 2019, copies of the approved plans can be downloaded from Lambert & Foster website or Ashford Borough Council website. Mains electricity is connected to the barn. Mains water is connected to the greenhouse. Buyers should rely on their own enquiries as to the suitability of the services for residential use. From the Wilsley Pound roundabout on the outskirts of Cranbrook, take the exit following the A262 signposted to Sissinghurst and Biddenden. Continue through Sissinghurst village and on taking the lefthand turning, off the righthand bend, to the Three Chimneys public house into Hareplain Road. Follow this road and on reaching the minor staggered crossroads proceed straight across into Bell Lane. Follow this lane passing The Bell Inn and on through Smarden Woods towards Pluckley, take the minor left hand turning into Greenhill Lane. At the end of this lane, at the T junction, turn left into Munday Bois road. Continue along, where upon the entrance to Farriers Barn will be found on the lefthand side, indicated by the white painted second set of five bar gates. The particulars and acreages stated therein, together with the plans are believed but not guaranteed to be correct. They are given by the Agents to assist viewers but are specifically excluded from any contract and prospective purchasers must satisfy themselves as to the information contained therein. Strictly by appointment with our Cranbrook Office (01580) 712888.